The Nokia N810 with its internal GPS is a device that should fit well for navigation purposes. Below you can see it running navit. 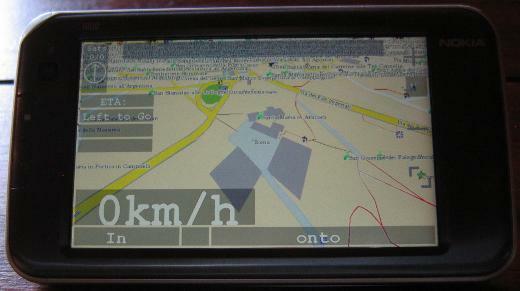 In my opinion this is the best available navigation software for the N810. Navit is the main reason for me for wanting the GPS unit in the N810 to be reliable. Get the svn version from here: Gerrit’s Techie Stuff. Some hints on getting navit to run on the N810 can be found on wiki.navit-project.org. Sadly the internal GPS unit of the N810 is known to be very problematic and occasionally hardly gets a fix. The suspect seems to be the gpsdriver. It writes i.e. the almanac data to /var/lib/gps/nvd_data. This file seems to be corrupt sometimes when the gpsdriver writes it. Probably the problem occurs when the GPS unit has no fix. The bug entry on this topic on bugs.maemo.org inspired me to write a small wrapper script for the gpsd that copies a backup to /var/lib/gps/nvd_data and watches the gps-daemon. When the GPS unit has a fix it creates a new backup copy of the nvd_data file for later use. Since I use the script, acquiring a GPS fix never took me more than five minutes anymore (without AGPS, with AGPS it is faster, of course). Log into your tablet using ssh and rename the original gpsd. That’s all, now you should have a much better working GPS unit in your N810. Since I only have one device to test this on, please leave a comment if this also worked for you. appending ‘true’ to this file will help. The box is running vserver-sources kernel 2.6.28-vs2.3.0.36.4-gentoo #2 SMP. in /etc/portage/package.mask. Afterwards everything reverted to normality.